The aim of the study was to determine and analyse the content of essential nutrients, the amino acid profile, phytochemical compounds, and antioxidant activity in the seeds of selected species and varieties of Fabaceae plants. The highest total protein content was detected in the seeds of the yellow and Andean lupines. The lupine seeds were characterised by a high (P < 0.05) level of crude fibre, NDF, and CEL. The highest proportion of EAAI (77%) was noted in the protein of chickpea, broad bean, grasspea, and pea. Among the Fabaceae plants analysed, chickpea seeds exhibited the highest (P < 0.05) levels of total phenols and polyphenols. The greatest (P < 0.05) antioxidant activity (DPPH) was noted for the lentil and yellow lupine seeds. Compared to the other legume representatives, the importance of lupine is increasing, as the chemical composition of its seeds makes the plant an important nutraceutical component. Currently, the proportion of legume seeds in the daily diet has declined in favour of meat and highly processed products. An imbalance in these proportions in the diet has a negative impact on human health. Therefore, nutritionists recommend a return to the consumption of legume seeds. The year 2016 has been declared as the International Year of Pulses (IYP) by the UNO to promote the use of legumes in human nutrition . Due to their high nutritional values, these plants are widely used as the main source of protein, in particular in the vegan diet. Besides protein, these seeds provide many other important components, i.e. minerals and B-complex vitamins, and have other vital health protective compounds (phenolics, inositol phosphates, and oligosaccharides). Their attribute is the low glycaemic index, therefore they may be recommended for people suffering from diabetes. Leguminous plants comprise many species, whose seeds differ considerably in their chemical composition and nutritive value . Besides nutrients, leguminous seeds contain undesirable biologically active substances, including anti-nutritional factors (ANFs)—tannins, alkaloids, glucosides, protease inhibitors, lectins, and others. They can impair food digestion and worsen the food flavour; additionally, those with toxic properties may aggravate the mineral health status. Besides the ANFs, legume seeds contain phytoestrogens, which possess antioxidant properties and diminishes the risk of cancer . The aim of the study was to determine and analyse the content of essential nutrients, the amino acid profile, phytochemical compounds, and antioxidant activity in the seeds of selected species and varieties of leguminous plants. The studied general-utility and consumption seeds of legumes were obtained in amounts of ∼5 kg from cultivation areas of South and East Poland in 2014. A random sample was taken after harvesting for chemical analysis. The content of dry matter and basic nutrients in ground seed samples (250 g of each accession) was determined according to standard AOAC  procedures. Fibre fractions, i.e. neutral-detergent (NDF) and acidic-detergent fibre (ADF), were assayed according to the method by Goering and Van Soest . The measurements were performed using an Ankom220 Fiber Analyzer (ANKOM Technology Corp., Fairport, New York, USA). The content of nitrogen-free extracts (NFE) was calculated as dry matter–crude protein–crude fat–crude fibre–crude ash. where a n is the AA content in the protein tested and a ns the AA content in the reference protein. To emphasise the value of the seed protein in terms of the content of limiting amino acids, only the CSLys and CS Met+Cys values are presented in the paper. The recommended levels of exogenous amino acids were as follows: Lys—7.0 g·16 g− 1·N, Met + Cys—5.7 g·16 g− 1 N, Thr—4.7 g·16·g− 1 N, Ile—5.4 g·16 g− 1 N, Trp—1.7 g·16 g− 1 N, Val—6.6 g·16 g− 1 N, Leu— 8.6 g·16 g− 1 N, His—2.2 g·16 g− 1 N, Phe + Tyr— 9.3 g·16 g− 1 N, for the whole egg protein standard . The tannin content in legumes seeds was determined with the Folin–Ciocalteu reagent and pyrogallol as a standard . The analyses were carried out at 760 nm in a UV–VIS spectrophotometer (Nicolet Evolution 300 LC, Thermo Fisher Scientific, Waltham, USA). The trypsin inhibitor activity (TIA) was analysed according to PN EN ISO 14902:2005 , expressed as trypsin inhibitor units (TIU) per milligram of protein, and calculated from absorbance read at 410 nm (UV–VIS spectrophotometer, Nicolet Evolution 300 LC, Thermo Fisher Scientific, Waltham, USA) against a reagent blank. One TIU was defined as a value that yields an increase in absorbance of 0.01 relative to trypsin control reactions using a 10-mL assay volume. The total phenolic content was determined using the spectrophotometric method . A methanolic solution of the extract at a concentration of 1 mg/ml was used in the analysis. The reaction mixture was prepared by mixing 0.5 ml of the methanolic solution of the extract, 2.5 ml of the 10% Folin–Ciocalteu reagent dissolved in water, and 2.5 ml of 7.5% NaHCO3. A blank was concomitantly prepared and contained 0.5 ml of methanol, 2.5 ml of the 10% Folin–Ciocalteu reagent dissolved in water, and 2.5 ml of 7.5% NaHCO3. The samples were thereafter incubated in a thermostat at 45 °C for 45 min. The results were expressed as GAE (gallic acid equivalents). Homogenised freeze-dried legume samples (0.5 g) were extracted with 5 × 5 ml methanol, in an UltraTurrax T25 (IKA.Werke, Janke & Kunkel) homogeniser. Aliquots of the methanolic legume extracts (0.1 ml) were transferred to GC vials and 50 μl of an internal standard was added (3-[4-hydroxyphenyl]-1-propanol solution, 19.2 μg/ml); next, the sample was evaporated to dryness under nitrogen and derivatised by addition of 250 μl N, O-bis(trimethylsilyl)trifluoroacetamide (BSTFA) at 70 °C for 20 min. Analysis of the samples was performed by an Agilent (Wallborn, Germany) HP series GC 6890N coupled with a HP 5973 MS detector (EI, 70 eV), a split–splitless injector, and an HP 7683 autosampler in an HP-5 MS capillary column (5% phenyl–95% methyl siloxane, 30 m × 0.25 mm × 250 μm). As standard the 3-(4-hydroxyphenyl)-1-propanol was used. Total antioxidant capacity was also expressed as a Trolox equivalent on the basis of the standard curve (R 2 = 0.9974). Analyses were performed in triplicate and all data were expressed as means. All the data of the chemical composition of the leguminous seeds were analysed with the Statistica software version 10.0 . The normality of data and homogeneity of variances were tested using the Shapiro–Wilk and Brown–Forsythe tests, respectively. The data obtained were analysed statistically using species as an independent variable in the general linear model (GLM) of one-way ANOVA analysis of variance or a non-parametric Kruskal–Wallis test (a non-parametric equivalent of one-way analysis of variance). Detailed comparisons between the means of the species legume were conducted using the post hoc Duncan or Dunn test. Pearson’s or Spearman’s correlation tests were conducted to determine the linear correlations among some variables. All statements of significance were based on the 0.05 and 0.01 probability levels. The analysed seeds were characterised by high dry matter (DM) content, i.e. over 900 g in 1 kg (Table 1). The analysed seeds exhibited a significant (P < 0.05) variation of the crude ash content ranging from ca. 44.3 g kg− 1 DM in the white and yellow lupine and grasspea to even 25.3 g kg− 1 DM in the pea (Pomorski cv.). The seeds of the legume plants were characterised by high protein content, in particular the yellow and Andean lupine seeds (427.4 g kg− 1 DM). The high content of this valuable nutrient, especially in the yellow lupine, was reported by Sujak et al. . The authors report that some cultivars of the species may contain as much as 482 g kg− 1 DM (Kroton cv.) or 471 g kg− 1 DM (Markiz cv.) of protein. The lowest (P < 0.05) total protein content in the analysed seeds was found for the common bean, pea, chickpea, and broad bean seeds (219 g kg− 1 DM on average). Similar total protein levels in these leguminous species were reported by other researchers [2, 14]. The nutritional role of these plants in the human organism is determined not only by the content of protein, but also its structure and functions. Two protein fractions, albumins and globulins, are distinguished. Albumins account for ca. 10–25% of total protein and serve a structural and enzymatic function in the human organism. Higher albumin levels contribute to a greater nutritional value of seeds. In turn, globulins are mainly regarded as immune proteins . Globulins can account for even 60–75% of proteins in pea, soya, and lupine seeds and 80–90% in common and broad bean seeds . The fat content ranged (P < 0.05) from 7.91 to 23.81 g kg− 1 DM in the seeds of a majority of the species analysed; higher levels of fat, i.e. 53 g kg− 1 DM on average, were detected in the seeds of the blue and yellow lupines and chickpea. In turn, the white lupine (100.3 g kg− 1 DM) and the Andean lupine (155 g kg− 1 DM) proved to be oil-bearing species. Similar ranges of the content of this nutrient in Fabaceae plant seeds were reported in literature [2, 13, 14, 17]. Nutritionists emphasise the need for consumption of leguminous plant seeds, due to their content of various dietary fibre fractions that are essential for the digestion process and actively counteract lifestyle and cancer diseases. Investigations conducted by Farvid et al. support the hypothesis that a higher fibre intake reduces the risk of breast cancer and suggest that consumption of large amounts of insoluble dietary fibre during the adolescence and early adulthood periods may have a preventive character. Especially high nutritional-therapeutic importance in this aspect is ascribed to lupine seeds, which are characterised by a high (P < 0.05) proportion of crude fibre (on average 117 g kg− 1 DM), in contrast to the chickpea and lentil seeds, which contained by ca. 78% lower levels of this nutrient (Table 1). The lupines and beans analysed exhibited a large level of the NDF fraction (on average 228 g kg− 1 DM) and CEL (on average 153 g kg− 1 DM). Literature data show that the fibre content in seeds may differ significantly in different species and their varieties . A special health-enhancing role is played by hardly soluble dietary fibre fractions, as they, e.g. improve the parameters of large intestine physiological status. They exhibit an ability to retain water, which directly increases the stool volume, thereby eliminating secondary bile acids and other toxic substances from the organism. Fibre fractions in lupine seeds not only can regulate the intestinal pH and moisture levels, but also have a beneficial effect on the morphometric parameters of the colon, e.g. the length of plica mucosae and the thickness of the muscular layer. Soluble fibre fractions and α-galactosides exhibit considerable proliferative activity due to the rapid fermentation processes . These processes occurring within reasonable limits are beneficial to health, as they contribute to stool loosening and regular defecation. The high fibre content in legume seeds ensures their basificating properties, which balance the acidifying effects of meat, eggs, and cereal products. The combination of legume seeds with meat, eggs, or cheese increases the digestibility of proteins contained therein . The amino acid profiles of crude protein and the values of their indexes are compiled in Table 2. Noteworthy, there are differences in the contents of both endo- and exogenous amino acids between the species as well as within the varieties. The greatest amount of essential amino acids was noted in grass pea cv. Krab, in chickpea, broad bean, and pea (over 40 g·16 g− 1 N) (Table 3). However, the differences in the mean levels of essential amino acids between the legume species were not confirmed statistically (P = 0.198), except for the glutamine content with the highest proportion in the protein of the Andean and yellow lupine seeds, in comparison with the lentil, grasspea, blue lupine, pea, broad bean, chickpea, and common bean seeds (P < 0.05). The highest CSmet+cys index was noted for crude protein of the yellow lupine (54%) and grasspea (52%) and the lowest for the seeds of common bean (30%), blue lupine (37%), and white lupine (39%). The highest EAAI (77%) was detected in the protein of chickpea as well as the protein of the broad bean (76%), grasspea (75%), and pea (74%), whereas the lowest values of this index were noted for the common bean and lupine protein (62–70%). Similarly, in the case of the indicators of the biological value of the protein, the statistical analysis did not confirm the differences between the Fabaceae species. In the analysed seeds of the legume plants (lupines, chickpea, pea, lentil, grasspea, broad and common bean), the content of glutamine and asparagine was the highest of all the non-essential amino acids (NEAA). Similar results were obtained by Iqbal et al. in their investigations of the chemical composition and nutritional value of chickpea, cowpea, lentil, and green pea seeds as well as Khattab et al. in their analyses of cowpea, pea, and kidney bean seeds. The protein of Fabaceae seeds is characterised by a lower value than that of animal protein and a higher value than that of cereal protein . This was confirmed in the present study by the high content of exogenous amino acids and the high biological value of the legume proteins. In this study, the content of essential amino acids (EAA) ranged from 41 g 16 g− 1 N in chickpea to 34 g·16 g− 1 N in common bean seeds, compared with the value of 51 g·16 g− 1 N in hen’s egg white used in the assessment as an amino acid standard . The Pearson correlation analysis revealed a high positive (P < 0.05) correlation between EAAI and the protein content in the analysed Fabaceae seeds (Table 5). Similar results were obtained in the investigations conducted by Khattab et al. , where the total essential amino acid content in different seeds ranged from 31.29 g·16 g− 1 N in the Egyptian pea to 36.12 g·16 g− 1 N in the Canadian kidney bean. In the present study, the EAAI value ranged from 77% for the chickpea to 62% to the bean, which was reflected in the CSMet+Cys value. The lowest value of this parameter, i.e. 30%, was estimated for the bean, while the yellow lupine exhibited the highest value (54%). The content of cystine and methionine in the lupine and grasspea seeds was strongly positively correlated with the protein content (P < 0.05) (Table 5). The available literature shows a high proportion of lysine and a relatively low level of sulphur amino acids and tryptophan in legume plant seeds [22, 23]. This was largely confirmed by the present results, as the CSLys value for all the analysed Fabaceae seeds was high (on average ca. 87%), and sulphur amino acids were the first limiting amino acids, with the exception of the Andean lupine, lentil, and yellow lupine protein, where tryptophan was the first limiting amino acid (20, 29, and 38% CStrp, respectively). Anti-nutritional substances comprise compounds that significantly diminish the nutritional value of leguminous plants, e.g. chymotrypsin and trypsin inhibitors (Table 4). Their negative impact is reflected not only in deterioration of protein digestibility through complexation thereof, but also in blocking the activity of proteolytic enzymes. This may result in pancreas hypertrophy and, due to intensified enzyme secretion, an increased demand of the organism for amino acids, in particular for methionine and cysteine . The strong relationships between protein and trypsin inhibitors are confirmed by the high values of correlation coefficients noted for nearly all legume seeds (Table 5). Yet, their effect on the organism may be positive in some circumstances. Trypsin inhibitors are applied in treatment of obesity, type 2 diabetes, and cancer disease as well as prevention of infarction and cardiovascular diseases . The greatest content of these compounds was determined in the grasspea and pea seeds (on average 129.3 and 47.06 TUI− 1 mg), and the lowest levels were noted for the yellow lupine and common bean seeds (on average 1.64 and 2.62 TUI− 1 mg) (Table 4). A similar variability in the content of these substances was reported by other researchers . However, despite the relatively small content of protease inhibitors in the lupine seeds, recent studies have suggested their unusual properties . They contain anti-cancer MMP-9 inhibitors, which are the most effective of those present in leguminous plants, inhibiting both gelatinases and HT29 migration and growth. Some authors suggest possible application of legume protein MMPIs as novel metalloproteinase inhibitors in anti-cancer pharmacological and nutritional strategies. Tannins present in legume seeds are classified as anti-nutritional compounds. Among the analysed cultivars, the highest tannin content was detected in the old variety of Andean lupine (16.34 g kg− 1 DM), whereas the new blue and yellow lupine varieties had by ca. 70% lower content of these compounds (Table 4). The lowest levels of hydrolysable tannins, i.e. 2.58 g kg− 1 DM, were detected in the white lupine seeds. Among the other species analysed, only the lentil seeds exhibited a relatively high level of these compounds, i.e. 8.72 g kg− 1 DM. A strong correlation (P < 0.05) was observed in this study between the tannin content and protein level in the blue lupine, yellow lupine, Andean lupine, lentil, grasspea, and broad bean (+) and in the white lupine and pea (−) (Table 5). Similar amounts of these anti-nutritional compounds in legume seeds were reported by Księżak and Bojarszczuk  in their investigations covering a very large area of Poland. They did not observe a significant effect of the site of cultivation on the tannin level, but correlated it with the species and cultivar. The present study shows a high correlation between tannins and protein. Tannins are polyphenolic compounds capable of formation of stable complexes with proteins, minerals, and vitamins A and B12, which results in deterioration of the digestibility and availability of nutrients. This harmful effect of tannins is alleviated by the thermal treatment of seeds . Fabaceae plant seeds are increasingly referred to as a source of antioxidants. Besides tannins, they contain phenolic compounds with important antioxidant activity, e.g. quercetin glycosides, kaempferol, and myricetins as well as caffeic, ferulic, and p-coumaric acids. They are mainly present in seed coats, and seeds of varieties with colourful flowers contain higher amounts of these compounds. These substances are believed to protect against cancer and cardiovascular diseases . The beneficial effect of polyphenols involves removal of existing reactive oxygen species from blood as well as prevention of ROS formation. Polyphenols can also inhibit oxidation of endogenous antioxidants in the oxidation process, e.g. 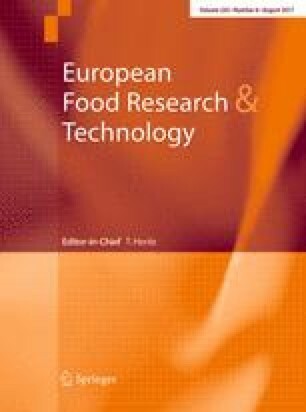 quercetin may prevent oxidation of vitamin C . Among the Fabaceae seeds analysed, the chickpea and common bean seeds proved to have the highest levels of total phenols (on average 439 mg 100 g− 1DM), and slightly lower contents of these compounds were determined in the broad bean and lentil seeds (on average 400 mg 100 g− 1DM) (Table 4). The lowest amounts, i.e. lower by 50%, were noted in the pea seeds. The chickpea seeds were characterised by the highest levels of polyphenols (P < 0.05). Approximately twofold lower levels of polyphenols were determined in the seeds of the lupine varieties, with the yellow lupine characterised by the highest content of caffeic acid and p-coumaric acid. Similar results were obtained by Siger et al. , who reported the highest level of these compounds in yellow lupine seeds (in particular in the Paris cv.). Furthermore, the authors emphasised that the antioxidant apigenin-6,8-di-Cp-glucopyranoside and apigenin 7-O-β-Apium furanosyl-6,8-di-Cp-glucopyranoside discovered for the first time in lupine seeds further enhanced the nutritional value of this plant not only as a high-protein raw material, but also as a rich source of antioxidants. A considerable variation in the content of antioxidant compounds in Fabaceae seeds has been reported by many authors [21, 30, 33, 34]. The antioxidant properties of the legume seeds were determined by the ability to scavenge the DPPH radical. The highest (P < 0.05) antioxidant activity (DPPH) was determined for the lentil and yellow lupine seeds (on average 8.16 mmol trolox equivalents g DM− 1). In the broad bean, blue, white, and Andean lupines as well as common bean, DPPH exhibited a level of ca. 7−5 mmol Trolox equivalents g DM-1. The lowest DPPH value was determined in the grasspea, chickpea, and pea seeds (respectively, 3.89, 2.97, 2.73 mmol Trolox equivalents g DM− 1) (Table 4). In the present study, there were correlations between DPPH and each polyphenol (Table 5). In the case of quercetin, a high correlation (P < 0.05) was noted for the white lupine (−), yellow lupine, Andean lupine, pea, chickpea, and common bean. In turn, a high correlation (P < 0.05) was found between total phenols and DPPH for the seeds of the white lupine, pea, and chickpea. There are literature reports of a moderate or even low correlation between phenols and DPPH measured with the DPPH and ORAC methods in lentil seeds . However, some authors report that the activity measured with the FRAP assay exhibited a strong correlation (over 0.8) with phenolic compounds and condensed tannins. Li at al. explain that this phenomenon can also be observed in other food products, which is related to the fact that phenolic compounds may have not only antioxidant properties. Potent antioxidant activity, particularly in relation to linoleic acid, was exhibited by aqueous and ethanol extracts of lentil, pea, lupine, or bean husks. Simultaneously, these preparations have been observed to have anti-inflammatory activity and a capability of selective 15-LOX inhibition, moderate COX-1 and COX 2 inhibition, as well as cyclooxygenase pathway inhibition . Given these properties, Fabaceae seeds can be regarded as a source of high-value nutrients, especially of protein, and can be useful in enhancement of human health and reduction of the risk of incidence of lifestyle diseases, i.e. cancer, degenerative diseases, obesity, and diabetes. Given their unique and very rich chemical composition and high nutritional value, legume plant seeds can be an important component of the daily diet. However, the content of biologically active substances that have so far been regarded as inessential or even anti-nutritional can promote the suitability of the seeds to be used as functional, health-enhancing foodstuffs, particularly for prevention of diabetes and obesity, which determine the quality of life for millions of people worldwide. In this aspect, lupine seeds, which have so far been used mainly as animal feed and are currently gaining importance as a nutraceutical component, should be given special attention.